The mere mention of airports in Berlin brings about a groan from locals. The truth is, the city is woefully under-served by its two current airports and attempts at providing a new, modern airport failed spectacularly. That said, there are two airports for Berlin that cater to national and international travel. Frankfurt's Airport is the busiest in Germany, but these two smaller airports do a serviceable job for the over 30 million visitors that come to Berlin each year. Plus there is a new airport opening someday, and an old airport worth a visit. Find out how to navigate Berlin's airports, what services they offer, and how to best reach the city. Berlin Tegel Airport (Flughafen Berlin-Tegel - TXL) is the main international airport of Berlin. Located in former West Berlin in Tegel, it is about 5 miles (8 miles) northwest of the city center. Opened in 1948 and once known as Otto Lilienthal Airport, it is the hub for most major airlines in Berlin and it flies to European and international destinations. It is quite small and often crowded, arranged in a hexagonal design with terminals shooting off the main section in an effort to handle its overflowing volume of passengers. The benefit of its small size is that it is quite easy to navigate and walking is minimal. Transferring within the airport is easy and can be done quickly, but you should budget at least 45 minutes to transfer if you don't need to go through security again. Once you enter your gate, it is usually just steps away from the plane (although buses are increasingly used to cart you the final distance to your plane). Use the airport map to plan your travel. Tegel Airport is open everyday from 4 a.m. to midnight. If a flight lands outside of these hours, the airport remains open. Already far exceeding its capacity in 2012, it has been set to be closed several times but continues to operate — much to the chagrin of residents who live in the current flight path like in Pankow. Vote after vote, the crumbling airport has been propped up in never-ending limbo. Tegel offers all the basics of shops, restaurants, and a tourist office, but don't expect a lot of options. Especially as the terminals are a bit spread out and if you are out in C or D, you are unlikely to go back and explore A and B. There are money changers, cash machines, and BVG (public transportation) ticket machines. For a city with excellent public transportation, options to and from the airport are surprisingly limited. The only option is by bus. An AB ticket for €2.80 can be used for up to 2 hours in a single direction to navigate Berlin’s comprehensive public network of buses, U-Bahn, S-Bahn, trains, trams and even ferries. Tickets can be bought from the machines outside the main terminal, on on buses, or at BVG distributors. The Jet Express (TXL and X9) lines run every 10-15 minutes and take 45 minutes to reach Alexanderplatz with easy connections to top sites in Berlin like Brandenburger Tor and the Hauptbahnhof, as well as the rest of Germany. There are a few other bus lines, like 128 and 109, that also leave from right outside the airport and take you to different points in the city. If you prefer private transport, there are taxi ranks in the inner ring of Terminal A at Gates 6-9 and outside Terminal C and E. Standard fares apply to all Berlin taxi drivers: base fare is €3.90, each of the first seven kilometers costs €2.00 and each subsequent kilometer is €1.50. There are also charges €1.50 per person, €1 for bulky items of luggage, €1.50 for non-cash payments, and €0.50 for a single journey from Berlin Tegel Airport. A typical taxi fare from Tegel airport to the city center is €30. Another option is to rent a car. All major rental companies are present at the airport on the lower floor near Terminal E and car park P2. The other major airport for Berlin is Schönefeld Airport (Flughafen Schönefeld - SXF). It is similarly outdated (opened in 1946) and maxed out, but is also the grounds for the planned new airport and has received some necessary updates. It is located 11 miles southeast of Berlin near the town of Schönefeld, bordering Berlin's southern border in former East Berlin. It is the base for major discount carriers easyJet and Ryanair. There are four terminals spread out across the airport as it is not quite as compact as Tegel. Refer to the Terminal map to orient yourself. Recently, more information has been added in English and direction lines to make navigating easier. Schönefeld is open 24 hours a day, but only people with valid travel documents can stay between 10 p.m. and 6 a.m.
Schönefeld offers basic shops, restaurants, as well as a tourist office, but there are limited options. There are money changers, cash machines, and BVG (public transportation) ticket machines. There are also a range of services for people flying with children, limited mobility, etc. Unlike Tegel where buses deliver you at the airport's door, there is a walk from the S-Bahn and regional trains to the airport. Budget a few minutes for the long walk and watch out for tardy fliers running to the entrance. That said, train is the easiest and cheapest method of traveling to and from Schönefeld Airport. There are several lines that connect the airport to the city center (such as the S9 or S45) and depart every 20 minutes for the 40-minute journey. There are also regional trains RE7 or RB14 (marked as Airport Express) making the journey with the fewest stops. These run 4 a.m. to 11 p.m. and take about 20 minutes to reach Alexanderplatz, 30 minutes to Hauptbahnhof, and 35 minutes to Zoologischer Garten. Schönefeld is located outside of the B zone (most travel in Berlin is in the AB zone, including Tegel airport) so you will need an ABC ticket for €3.40. Buy this from the machines below the platforms and validate on the platform before boarding the train. Another option is to travel by taxi. There are lines of taxis waiting outside the main terminal and they cost around €40 and take around 35 minutes. If you prefer to drive, there are a range of major car rental companies at Schönefeld to choose from. The car rental center is located directly in front of the main Terminal A. The return area is located at multi-story car park P4. The situation with the "new" Berlin-Brandenburg International (Flughafen Berlin Brandenburg "Willy Brandt" - BER) Airport is complicated. Set to open in 2011 and close the two existing airports, plans to use this site were abruptly abandoned when reporters were invited to see it for a big reveal and it was obviously not ready. This embarrassment of German efficiency has continued for years now, still costing Berlin millions of dollars in security and maintenance on an unusable airport. The date for its opening have been pushed back several times and the expected opening is now autumn 2020. Unfortunately, the airport would have already been too small to handle the city's traffic if it had opened on time so it remains to be seen what will happen with this airport, as well as the two older airports. However, BER does utilize some of Schönefeld's existing infrastructure and these much needed updates have allowed for expansion of that airport's services. 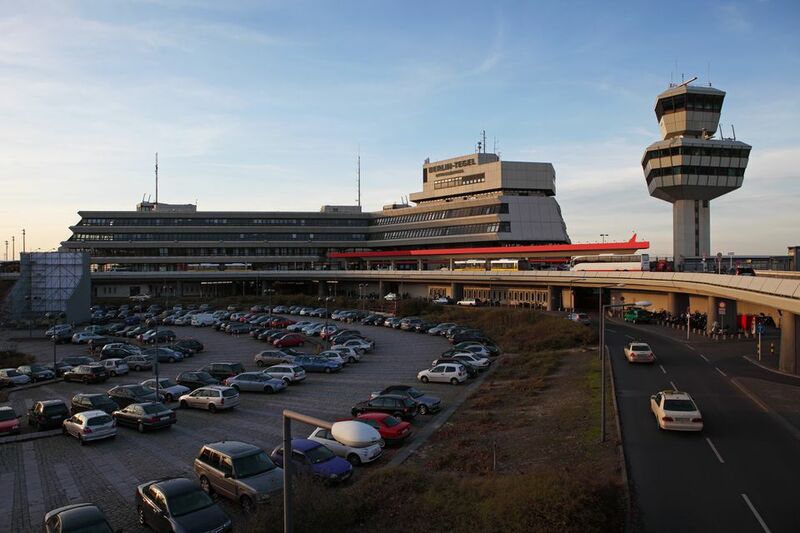 Yet another Berlin airport is no longer in use, but is still an integral part of the city's rich history. Tempelhof Airport between the neighborhoods of Neukölln and Tempelhof dates back to the 1920s and was one of Berlin's first airports, as well as the site of the historic Berlin Airlift. Operations closed in 2008, but as it became a listed building in 1995 there was a question of what to do with it. After much debate, a public vote was held and it was decided to open the massive grounds as a public park. Today, bikers, skaters, runners and more can make their way down the runway with its hangers and other buildings housing various businesses, festivals, and are even used as a space for refugees.